Disney World has three tiers of resorts – Value, Moderate, and Deluxe. While there are no “bad” Disney hotels, Disney Deluxe resorts offer guests the best of everything: better transportation options, upscale decor, spacious rooms, amazing dining variety, beautiful pools, on-site recreation services, and loads of other great amenities. If you aren’t scared off by the higher prices, Disney’s Deluxe resorts then you will be rewarded with plenty of extra magic that you won’t get at other hotels. With that said, let’s first review the aspects that make Deluxe resorts the superior lodging choice at Walt Disney World. Next, we will count down the best Disney Deluxe Resorts to help you decide which one is right for your vacation. What are Disney Deluxe Resorts? Disney’s Deluxe resorts are hard to define. There are major differences in location, themes, dining options, transportation services, on-site services, property layout, pools, etc. If we had to narrow it down, the three major defining characteristics are 1. better transportation options, 2. better amenities, and 3. more expensive (unfortunately). Refer to our Disney World Map and Disney World Transportation Map page to get a better perspective on the layout and location of each resort. While Value Resorts provide an inexpensive and kid-friendly option – and Moderates have slightly higher rates yet better amenities, ambiance, and transportation options than Values – Disney Deluxe resorts offer the best of everything (minus an affordable price tag, of course). One of the biggest differentiating factors of Deluxe resorts is their proximity and accessibility to the theme parks. Transportation options at Deluxes are much more varied and – in general – much better. Unlike Value and Moderate resorts – where guests are dependent on bus transportation – Disney Deluxe resorts offer a wide range of transportation options ranging from monorails and boats to buses and even walking to the theme parks. Guests staying at the Magic Kingdom area resorts have the option of taking the monorail or boats to magic, and buses to the other theme parks and water parks. Because of its close proximity, guests staying at the Contemporary can walk to Magic Kingdom if they wish. Those staying at the Boardwalk area resorts can either walk or take a ferry boat to Epcot and Hollywood Studios, and buses to other theme parks and water parks. Guests staying at Animal Kingdom Lodge can either walk to Animal Kingdom or use bus transportation to get to other theme park destinations. And of course, all guests staying at a Walt Disney World on-site property receives early access to FastPass+ and Dining reservations, complimentary MagicBands, Extra Magic Hours, Disney Dining Plan eligibility, complimentary transportation to/from the airport, and more. This alone makes staying at a Walt Disney resort a better option than staying at an off-site (non-Disney) resort. When it comes to Disney Deluxe resorts, there is only one glaring negative: the price. Unfortunately, Disney’s Deluxe resorts are priced significantly higher than Value and Moderate resorts. There is a vast range of pricing among the Deluxe resorts, depending on which resort you choose and the time of year you go. You can expect the least expensive standard Deluxe rooms to cost a few hundred dollars (during the value season), whereas the most lavish rooms can top-out in the thousands (!). Many guests will be priced-out of Deluxe resorts and should instead focus on finding a Value or Moderate resort that fits within their budget (there are plenty of great options to choose from). But for those of looking to splurge on your vacation – or for you whom money is not an issue – we hope that you find our top 8 best Disney Deluxe resorts list helpful in narrowing down your choice. Each Disney Deluxe resort offers something special. They are all fabulous in their own special way, so ranking them is a difficult – and subjective – task. Our rankings are based on a combination of different factors, including location, transportation, theme, dining, value, pools, landscaping, and amenities. The BoardWalk area of Disney World is a quarter-mile promenade along the shores of Crescent Lake, filled with shopping, dining, and nighttime entertainment. Opening in 1996, Disney’s BoardWalk Inn Resort lies in the heart of this Coney Island-inspired BoardWalk section. The resort itself is modeled after an early 1900’s Atlantic City grand hotel and exudes a Great Gatsby sort of feel. The lobby decor is elegant and upscale, and its over-sized deck is a perfect spot to unwind after a long day at the theme parks. Disney’s Boardwalk Inn Resort offers plenty of dining options. However, most of these are found outside the resort in near BoardWalk locations. Highlights include the Big River Grille & Brewing Works (classic American style lunch and dinners), BoardWalk Bakery (pastries, etc), ESPN Club (fun sports theme restaurant), Flying Fish Cafe (seafood), and Trattoria al Forno (Italian cuisine with a to-go pizza window). The resort’s Luna Park Pool is themed after a 1920’s – 1940’s carnival, and you can find a “quiet pool” in the Villas section of the resort. As far as transportation goes, Epcot is just a short walk or boat ride away. Most other destinations will require bus transport, with the exception of Hollywood Studios (boat or 20-minute walk). Bottom Line: There is certainly plenty to love about the BoardWalk Inn. It’s situated right in the heart of the entertainment district of Disney World and along the banks of beautiful Crescent Lake. The resort offers a wide variety of dining spots and easy access to Epcot. However, there are a few flaws. The layout of the resort is confusing; you could easily get lost among the long winding hallways. As far as dining goes, guests must first leave the resort grounds and then enter a restaurant from a separate BoardWalk entrance. As such, it feels much more like you are sharing your dining experience with guests staying at other resorts. Because it lacks a “sense of place” more so than other resorts, we prefer other Deluxes which feel like its a world onto its own. The BoardWalk is a great area to visit once or twice on your Disney vacation. However – for the money – we would rather stay at a resort with a better theme, better pool, and its own unique dining options and identity. It’s a beautiful resort, but not the best Disney Deluxe resort for the money. Situated along the banks of Crescent Lake, Disney’s Yacht Club Resort is a grand hotel themed to resemble a late 1800’s New England yacht club. The decor is stately and elegant with upscale nautical touches throughout the property. The resort is five-stories with 630 room, making it slightly larger than its sister resort, the Beach Club. Like other Deluxe resorts, the Yacht is in close proximity to many Disney attractions. Its well within walking distance to Epcot, Hollywood Studios, the Boardwalk promenade, and other nearby resorts. 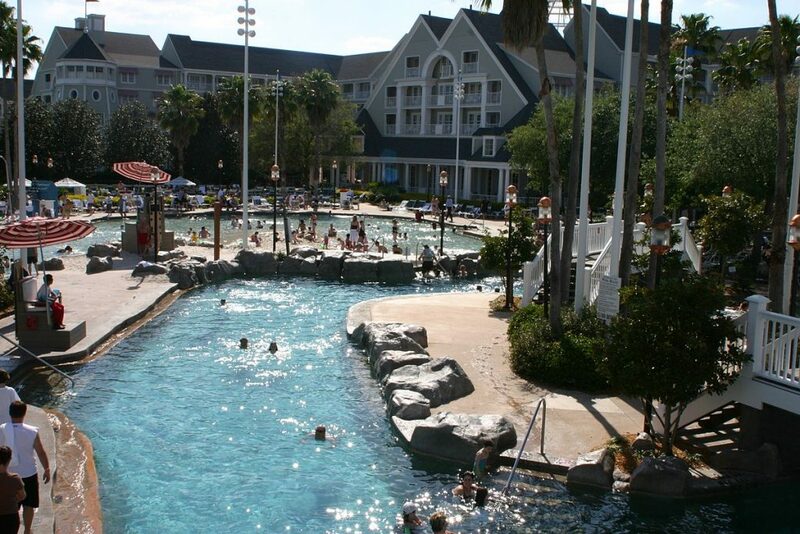 The Yacht Club and Beach Club resorts share quite possibly the best pool at Disney World – Stormalong Bay. This three-acre water wonderland has a lazy river winding through it, sandy-bottom wading areas, whirlpool spas, water slides, and pool bars. The resort also has a “quiet pool” and hot tub location for outdoor relaxation. The Yachtsman Steakhouse is an upscale fan favorite, and Ship Shape Health Club another major asset to this resort. Bottom Line: The Yacht Club is a beautiful resort. Its proximity to Epcot is unmatched. If pools are a top priority, the Stormalong Bay pool complex a major selling point of both the Yacht Club and Beach Club resorts. In addition, The Yachtsman Steakhouse will appeal to those who enjoy a good meal in an upscale setting. As far as negatives, the upscale “stuffy” theme of The Yacht Club may turn some people off. While children will most certainly enjoy the pool and lakeside activities, we think that this resort is best for adults (and not children/families). Other negatives include the lack of a quick service dining option and the fact that guests share bus and boat transportation. All in all, it’s a fabulous resort if you enjoy fancy hotels, nautical theming, and spectacular pools. Less so if your priorities lie with fun themes for kids. Disney Beach Club Resort shares a lot of similarities with its sister resort, Yacht Club. They both have a turn-of-the-century, New England nautical theme and great proximity to Epcot, the BoardWalk, and Hollywood Studios. While the Yacht Club is decorated with dark wood and brass, the Beach Club has lighter peach/green/blue accents and a more laid-back vibe. 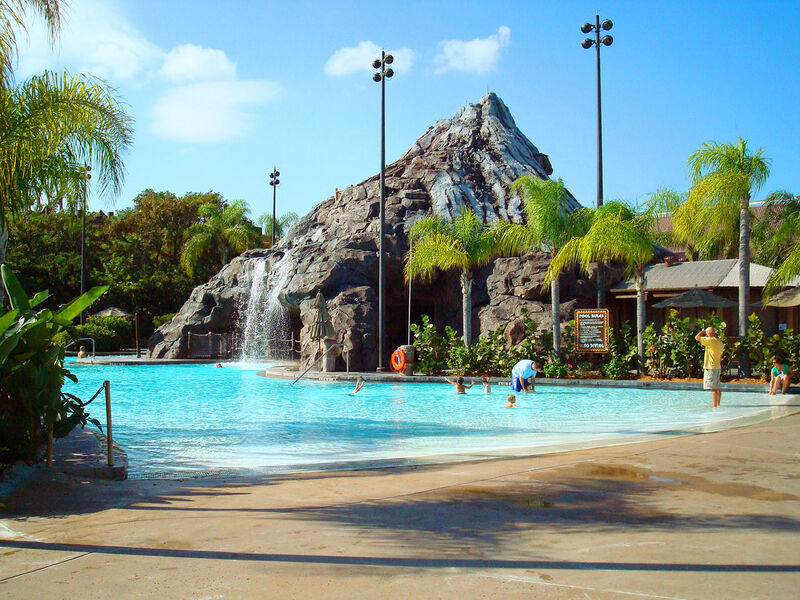 Both share bus service to the theme parks, as well as quite possibly the best pool at Disney World – Stormalong Bay. Dining at Beach Club Resort includes Cape May Cafe (a casual character dining restaurant), Beaches & Cream Soda Shop (a diner-style restaurant serving ice cream and burgers), and a couple of great poolside eating and drink establishments. Other features include “quiet” pools, a beach along the shores of Crescent Lake, a marina with watercraft rentals, arcade, conference facility, and the Ship Shape Health Club. If you love beach themes and easy access to the theme park, this is a good resort to consider. Bottom Line: The Beach Club has a more family-friendly vibe than its sister resort, The Yacht Club. The resort has a wonderful character breakfast, seafood buffet in the evening, and is easily walkable to Epcot International Gateway. On the downside, most rooms at the Beach Club do not have balconies (rooms at the Yacht Club all have full balconies). There are also no upscale table service restaurant (however, The Yachtsman at Yacht Club is walkable) and is further from the to the boat dock than is Yacht Club. Overall, The Yacht Club has more appeal for adults who prefer the upscale feel, while the Beach Club is better for families and those who want a laid back, casual environment. Both resorts are nice, but the theme of Beach Club has a slightly more universal appeal. Disney’s Animal Kingdom Lodge is an African-themed resort directly adjacent to Animal Kingdom theme park. The lodge is 6 stories tall and features an impressive array of architecture and detailed interior design which beautifully captures its wildlife and African landscape themes. One of the highlights of the resort is its expansive lobby area and viewing area, which overlooks 30 acres of land filled with the roaming animals and exotic birds of Animal Kingdom. Adventurous eaters will delight in the unique, African-inspired signature dining experiences of Jiko and Boma, while art lovers will enjoy the resort’s extensive African art collection. To relax, Animal Kingdom Lodge offers some amazing themed pools and a luxurious spa and fitness center. Rooms choices include standard rooms, pool view, and savannah view. Bottom Line: Animal Kingdom is stunning and unique. The dining experiences are some of the best found anywhere at Disney World, and the fact that certain rooms overlook the savannah adds some extra magic that you won’t find at any other resort. Uniqueness aside, there are a few faults. The location of the resort is right next to Animal Kingdom, but far removed from the rest of Disney World. Guest must rely on bus transportation to bring them to/from the theme parks and Disney Springs. Rooms are also smaller than other Deluxe resorts (with the exception of Wildness Lodge). The resort has many devoted fans and it is certainly appealing on many levels. However, due to the high room rates and limited transportation options, we prefer to just visit the resort’s lobby, grounds, and viewing room area (open to the public)….but stay at a more centrally-located resort. Located between Bay Lake and the Seven Seas Lagoon – and adjacent to the Magic Kingdom – the Contemporary Resort is easily identified by its ultra-modern A-frame main building. The resort opened in 1971 as one of the original hotels built on Disney World property. To this day, it’s still a favorite among guests. There are two sections of the resort – the Tower (14-story A-frame) and the Garden Wing. The Grand Canyon Concourse – located on the 4th floor of the Tower – is where you will find restaurants, shops, and the famous monorail station, where the monorail runs through the building. The location of the Contemporary Resort is one of its selling points. Guests can either walk or ride the monorail to Magic Kingdom, Epcot is also easily accessible by monorail (by transferring to a different monorail at the Ticket and Transportation Center). Guests can visit the nearby Polynesian and Grand Floridian resorts via monorail, or hop a boat to Wilderness Lodge and Fort Wilderness. The Contemporary is home of some popular dining options, including upscale California Grill and the character dining/buffet of Chef Mickey’s. The resort is host to numerous recreational activities, 2 decent pools, and some of the largest rooms on Disney World property. Bottom Line: The Contemporary Resort has a lot of things going for it. Its close to all the action and the transportation options make it easy to get anywhere in the park. The amenities are top-notch and everything is modern and updated. While the Tower rooms have great views and are closer to the monorails station and restaurants, they are considerably more expensive than the standard Garden Wing rooms. The Contemporary Resort also lacks the interesting resort themes found in other Deluxe resorts. It’s a fabulous hotel to stay in because the monorail runs through it and you can walk to Magic Kingdom. However, we tend to prefer the feel of the other Magic Kingdom area resorts more than the Contemporary. Disney’s Grand Floridian Resort and Spa is considered the flagship resort of Walt Disney World. With its magnificent architecture, white sandy beaches, Victorian-themed lobby (with live jazz band), red gabled roofs, and stark white walls, the Grand Floridian exudes a classiness not found elsewhere in Disney World. The resort’s rooms are some of the largest at Disney and are full of luxurious details. But with this elegance comes a steep price – the resort has the most expensive standard rooms in the park. Despite the ultra-classy feel, Grand Floridian manages to have some simpler (and kid-friendly) elements. The “Alice in Wonderland” themed children’s pool area and the Arcadia Games arcade are great for kids. Plus, there is a host of other on-site activities geared towards the young and restless. At the Grand Floridian, the finer things don’t disappoint. Dining options include the Five Diamond Award-winning Victoria & Albert’s restaurant, the Mediterranean-influenced cuisine of Cítricos, and other amazing cafes, grills, lounges, and pool bars. Guests can indulge at Senses, a Victorian-themed, full-service spa and health club which offers massages and body treatments. The resort is just one monorail stop away from Magic Kingdom, a boat ride away from Wilderness Lodge, and easily accessible to nearby Magic Kingdom Resorts. Epcot is also accessible by monorail. However, bus transportation is necessary to reach other destinations. The Grand Floridian is also a top Christmas destination because of its elegant Victorian holiday decorations, massive Christmas tree, and an elaborate (and edible) gingerbread house. Bottom Line: If money was no object, this would be the place to stay. It’s simply a beautiful resort in every way. And despite its luxurious features, the resort manages to feel unpretentious and relaxed. The Grand Floridian has some of the finest restaurants in Disney, very spacious rooms, over-sized pools, and easy access to Magic Kingdom. As far as negative, transportation to other sections of Disney World can be time-consuming. Unfortunately, the room rates are very high and, thus, prohibitive for most people. 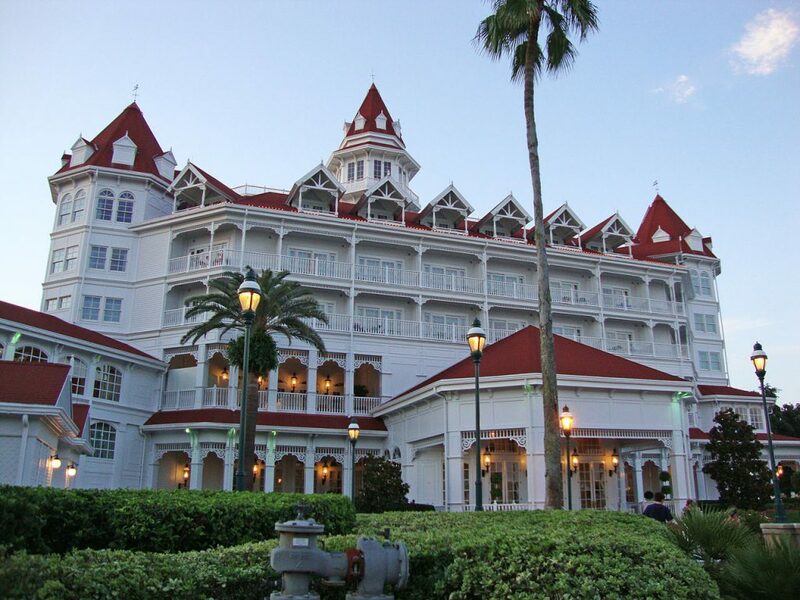 If you want to splurge – or if money is no object – Grand Floridian is a top-notch choice. Disney’s Wilderness Lodge is located on the shores of Bay Lake in the Magic Kingdom resort area. The hotel is modeled after Old Faithful Inn, a historic resort in Yellowstone National Park. The resort’s outdoorsy Pacific Northwest theme is evident as soon as you step inside the lobby. Its interior is filled with interesting wilderness and craftsmanship elements, such as an 82-foot working fireplace with stone hearth, majestic totem poles, wood carving decor, and even tepee chandeliers. Outside you can view the Fire Rock Geyser and hot springs, gaze out at the murmuring creek as you relax in wooden rocking chairs, or explore the nature trails winding through the nearby pine forest. Despite its rustic theme, Wilderness Lodge still manages to seamlessly blend the untamed nature element with the elegance of a Four-Star hotel. While Wilderness Lodge is a quiet oasis away from the parks, it’s not quite as remote as it seems. Guests can take the “red flag” ferryboat directly to Magic Kingdom, or the “blue flag” boat to Disney’s Contemporary Resort and Fort Wilderness Resort & Campground. Wilderness Lodge is also situated near the Ticket and Transportation Center. Bus service to other areas of Disney World is shared with Polynesian and Grand Floridian resorts. Wilderness Lodge has 2 pools: the lively Copper Creek Springs Pool has a 67-foot water slide, and Boulder Ridge Cove Pool is more of a quiet oasis. As for dining, guests can enjoy the rustic elegance of Artist Point, or the casual fare of Whispering Canyon Cafe, Geyser Point Point Bar and Grill, Roaring Fork, or the log-cabin themed bar, Territory Lounge. Wilderness Lodge really shines around the holidays when decorated Christmas trees, gingerbread houses, model trains, and other festive decorations entice guests to the Lodge. Bottom Line: Wilderness Lodge Resort has the right combination of positive attributes. For one, standard rooms are priced much lower than other Magic Kingdom area resorts. While its true that Wilderness Lodge has smaller rooms and isn’t on the Magic Kingdom monorail line, the standard rooms are still spacious enough to be comfortable and the transportation options are still better than many other Deluxe resorts (and who doesn’t love a boat ride to Magic Kingdom?). Plus the resort gives you a peaceful feeling because you are away from the hectic areas of the park. The pools are lots of fun and the restaurants are quite good (as is Territory Lounge for an evening unwind). Not everyone will love the rustic Northwestern theme, but we certainly do. And as far as value goes, Wilderness Lounge has most of the great things we look for in a resort at a reasonable price point. Polynesian Village Resort opened on October 1, 1971 as one of Disney World’s first two on-site hotels. The resort has a tropical South Seas/Polynesian Island theme. With its bamboo tiki torches, lush landscaping, lei necklaces, waterfalls, and beautiful sandy beaches, the Polynesian Village Resort attempts to create a Disney World version of a laid-back paradise. And it succeeds! This resort has been a favorite among children and adults alike for decades. After recent renovations, the resort is even better than before. Disney’s Polynesian Village Resort has 847 rooms and is situated on the banks of Seven Seas Lagoon. Its just two stops from Magic Kingdom on the monorail line, and easily accessible to the Ticket and Transportation Center and other theme parks (mostly by bus). Polynesian Village Resort is home to several casual dining establishments, buffets, lounges, and pool bars, as well as the hugely popular ‘Ohana (character dining) and Spirit of Aloha (dinner show). As far as pools, kids especially love the 142 foot-long water slide of the volcano-themed Lava Pool, while adults delight in the tranquility and lush landscaping of Oasis Pool. Other features include motorized boat rentals, Movies Under the stars, campfires, fishing, nighttime kids activities at Lilo’s Playhouse, volleyball on the beach, and more. Bottom Line: We chose the Polynesian Village Resort as the best Disney Deluxe resort because it has the most crossover appeal to every age demographic. The resort manages to feel upscale while also being laid back and fun at the same time. It has fantastic dining, endless activities, plenty of places to escape the hustle and bustle of the park, and easy access to Magic Kingdom and area resorts. The typical grounds are beautiful and the South Pacific island theme is one that’s easy to get behind. After all, who doesn’t just love a tiki/beach/paradise theme? As far as disadvantages, standard rooms are less expensive than Grand Floridian but more expensive than other Deluxe Resorts. Also, there really isn’t an upscale table service restaurant for a nice, quiet dinner. However, other Magic Kingdom resorts are just a stone’s throw away, and Polynesian Village’s casual dining and lounges are excellent. A Disney World vacation is all about finding what works best for everyone in your party. There really is something for everyone at this resort, and thus, the Polynesian Village Resort is #1 on our Best Disney Deluxe Resorts list. We hope our Best Disney Deluxe Resorts page has helped you prioritize your lodging for your Disney World vacation. If Deluxe resorts are not within your budget, you may be interested in our Best Disney Moderate Resorts and Best Disney Value Resorts pages. For more useful Disney World information, please review some additional pages on MagicGuides, such as our helpful Disney Dining Plan Calculator, Best Disney World Souvenirs, Crowd Calendar, and Disney Travel Planners articles. If you need help planning and booking your magical Walt Disney World vacation, contact our friends at The Vacationeer. Their services are always helpful and totally free of charge! Thank you for reading our page, and we hope you have a magical Walt Disney World vacation!